AROUND THE WORLD WITH PODCAST 154!! 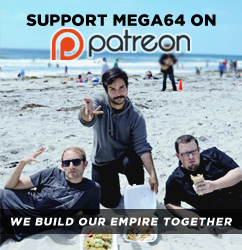 The latest Mega64 Podcast episode is a doozy! We greet you from our absolutely unbearably hot studio to talk about last weekend's GameDays event, followed by Rocco's Tokyo Game Show 2010 footage. We discuss the "Goodbye Bungie" and "Castlevania" videos, but not before Rocco has a world-exclusive interview with an internet media starlet! You simply have to watch this below. Click here for the audio version. Thanks to EVERYONE who came to see us on Sunday at Disneyland! We had a great time (but sorry it was so hot). We'll be back with more video fun soon, and stay tuned for a more up-to-date schedule on what we're doing at EXP Con in Florida!